Text & Photographs By Becky Wolfe © All rights reserved. Sage Brush! Sweet White Clover! 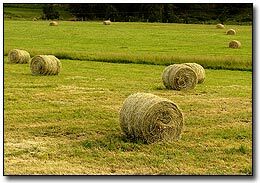 Fresh Baled Hay! So often in the summer, road trips comprise of long drives in the car with the windows rolled up & and air conditioning on. We cruise from destination to destination this way and enjoy the scenery along the way. Its not until we take the motorbike out for a drive that I realize how much I'm missing by being in a tightly sealed car: the smells of the open road! 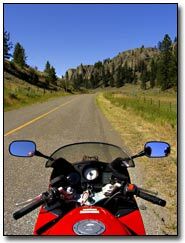 Riding on a motorbike not only gives one a higher & wider perspective of the scenery but you get to breathe in & experience all the sensual smells of summer! 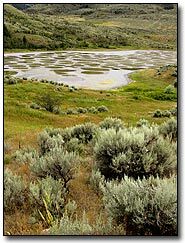 The desert region around Osoyoos, British Columbia is the perfect climate for sage brush. It covers the hills from Washington right up through the Okanagan Valley with its soft silvery leaves, but its smell is unmistakable. Even with my eyes closed, when I inhale that tangy acrid smell, I know that I'm driving through an area where the sage is growing! Intertwined with antelope bush, rabbit brush and plenty of cactus, the beauty of this desert climate encompasses the senses. White Sweet Clover is probably one of my favorite summer smells because it evokes countless memories of camping as a child in areas that were surrounded with clover. That intoxicatingly sweet aroma on a hot summer day takes me back to a time when riding bicycles, catching butterflies with nets & reading books were the only concerns of a summer day. Considered by most a weed, white sweet clover can be found growing along many roadside and empty lots & fields throughout the southern interior of British Columbia. There probably aren't too many people who don't enjoy the smell of fresh cut hay. Seeing the large equipment working away in green & golden fields, spewing out cubes or rolls of hay is a nostalgic sight for many & a wonderful smell on a scenic drive! There is, however, one downfall to enjoying these summer smells from the back of a motorbike and that is not being able to block out the unpleasant smells. Unlike my car, I can't just roll up my windows to escape the smell of a steaming cattle lot, a hot water treatment plant or fresh road kill. The only option then is to move on & get away until the air is fresh again. So whether its sage or clover, hay or some other smell like pine trees, peaches or fresh cut lawns, summer smells are like no other time of year. If you don't have the opportunity to ride on a motorbike, find yourself a quiet road, roll down your windows and allow your nose to discover new summer joys that you may have otherwise missed.